Welcome to Hobart Cold Storage. 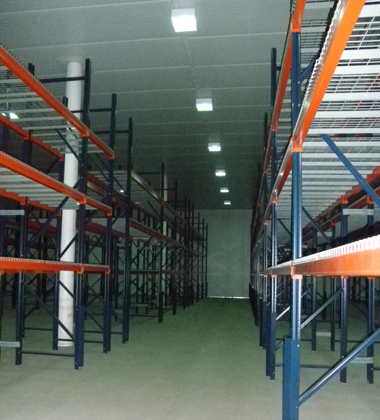 60,000 sq ft of temperature controlled space dedicated to cold, freezer and dry storage. We also offer warehouse and office space. We are located at 1601 W. 37th Avenue, Hobart, Indiana, 1.5 mi east of Interstate 65 on Ridge Road. With easy access to I-65, this location is convenient for all of Northern Indiana as well as Chicago and its suburbs. The building has been recently updated and remodeled. There is a 10,000 sq ft freezer that is 100' x 100'. It has 650 pallet positions with racking. It has 20 ft. ceilings and a 90 degree temperature differential. There is an additional 25,000 sq ft area, with an additional 130 pallet positions, which is chilled and can be divided. There are 6 drive-in coolers that can be run with a 40 to 60 degree temperature differential. The building has 8 semi loading docks with levelers as well as 6 delivery truck docks. We have ample parking on 8 acres of land.